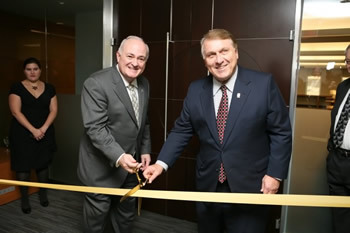 Last Thursday night I had the privilege of being a part of the opening at a new research center in the George Washington University’s Estelle and Marvin Gelman Library. Officially named the International Brotherhood of Teamsters Labor History Research Center, the IBT’s collection of historic documents will be permanently housed here in an effort to encourage more study of organized labor. As a result of this partnership, much of IBT’s historic document collection will now be accessible by scholars who have an interest in understanding the history and impact of organized labor in the 20th century. Among the more notable items are a wire recorder, believed to be one of the few remaining in the world, and a photo of Jimmy Hoffa and Martin Luther King Jr. I was asked to provide some perspective as a student at GW, and found myself speaking before GW President Knapp and IBT President James P. Hoffa. Being involved in the education system for my entire life, I was all too pleased to provide such a perspective. It seems obvious that IBT and organized labor has played a prominent role in the economic, political, and social development of our country. You can see its tangible effects in laws that protect worker safety and provide benefits like workers compensation and health care. And the laws are indicative of more than temporary acquiescence to organized labor. As a people, we enjoy a deep connection to our labor force that is constantly made stronger by our appreciation for their work and sacrifice. This connection was not made overnight, and it has not been an easy road traveled. This is why IBT’s partnership with The George Washington University is essential. The resulting research center will not only provide us with an understanding of our past, but also supply a yellow brick road for our future. Primary documents in this collection will now be made available to students and scholars alike in an effort to broaden our perspective on a variety of topics. Classes of politics, economics, labor history, and women’s studies will all benefit from research done at this center. A large portion of IBT’s collection has been transferred to the research center, but both IBT and GW are searching for more documents and records to add to the collection. Years in the making, the research center should prove to be a preeminent source of labor history. For more information you can visit the GWU press release here, and see the Gelman library homepage here. About The Author: Ravi Bakhru is a third year law student at George Washington University. He currently works as an intern for Workplace Fairness, and has an interest in pursuing labor and employment law in the future. To get in touch with Ravi, you can email him at Ravi.Bakhru@gmail.com.